This week, we're kicking off a regular monthly feature that highlights Tradeloop members who have been part of the trading community for 5 years or longer. We considered calling them "Trusted Users" or "Trusted Members," but our stringent membership verification procedures mean that all Tradeloop members are "trusted." 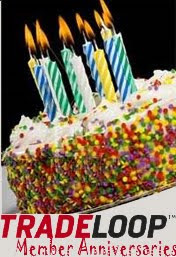 Instead, we'll celebrate and honor our longtime members once a year during the month they joined Tradeloop. Congratulations to all these Tradeloop members and thank you for being part of the community.